Come and join us for our annual Christmas service and festivities followed by fellowship, coffee and desserts made by our congregation. 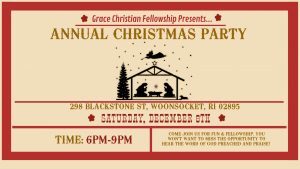 The gathering will be Saturday, December 8th from 6:00pm to 9:00pm. All are welcome to attend.